Stacktical aims to deliver instant compensation when there are outages to the internet, apps or related services. The idea is that if apps, websites, or other online services go down, users receive instant compensation. This is possible thanks to the blockchain, and there is no need to submit proof or a compensation claim. Instead, you get instant payment. Stacktical prides itself on showing the future of customer service. Service level agreements are contracts that outline the quality of service that a customer will get from a cloud provider. Additionally, the SLAs provide the fair methods of settling any disputes if that level of quality is not met. The issue with traditional service level agreements is that they tend to be expensive for providers to offer. As such, only the largest clients are typically able to make use of them, and they pay a premium for doing so. Stacktical converts service level agreements, changing them into smart contracts that are crowdfundable. This makes it possible for everyone to get reliable cloud services via an SLA. With this ability, cloud service providers can reward excellence in their operations. They can also provide automatic compensation for unresponsive customer support, downtime, or slowdowns. Why Does Stacktical Use the Blockchain? The use of the blockchain helps Stacktical reinvent the connection between service stakeholders. This is done via the DSLA token and its incentives. The result is the ability to achieve efficiency that has never been seen before when managing SLAs. The blockchain solution contrasts sharply with even the current top systems used by mature service providers. Those existing solutions tend to be feature-heavy service desk solutions requiring months to master and deploy. Even with the time and effort, those existing solutions do not deliver the business results companies want from SLAs. DSLA is the utility token for the Stacktical platform. The name of the token is an abbreviation for Decentralized Service Level Agreement token. This is the fuel for the platform and an ERC-20 crypto token that uses the Ethereum blockchain. Policyholders automatically receive a distribution of DSLA tokens based on the specific reward and compensation policies within the decentralized service level agreements. 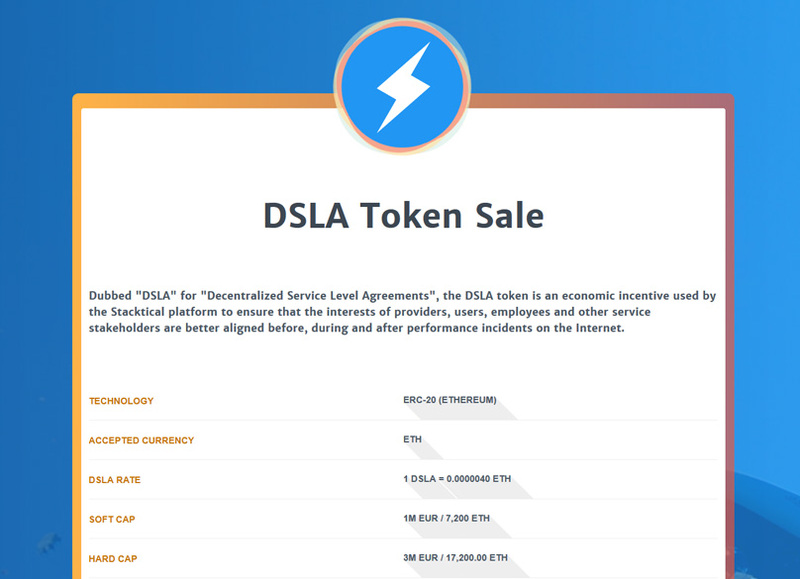 Compared to the total amount of DSLA tokens, 50 percent is allocated for the token sale. 25 percent is in reserve with 15 percent for the team, 5 percent for the bounty program, and 5 percent for advisors. Of the proceeds from the token sale, 57.5 percent will go to research and development. A further 20 percent go to exchange listing. Five percent is allocated each to events, advertising, administration, and legal fees. The final 2.5 percent of proceeds go toward content. How Does Do DSLA Work in Stacktical? Stacktical outlines the functionality of DSLA and its platform in a simple diagram on its one-pager. 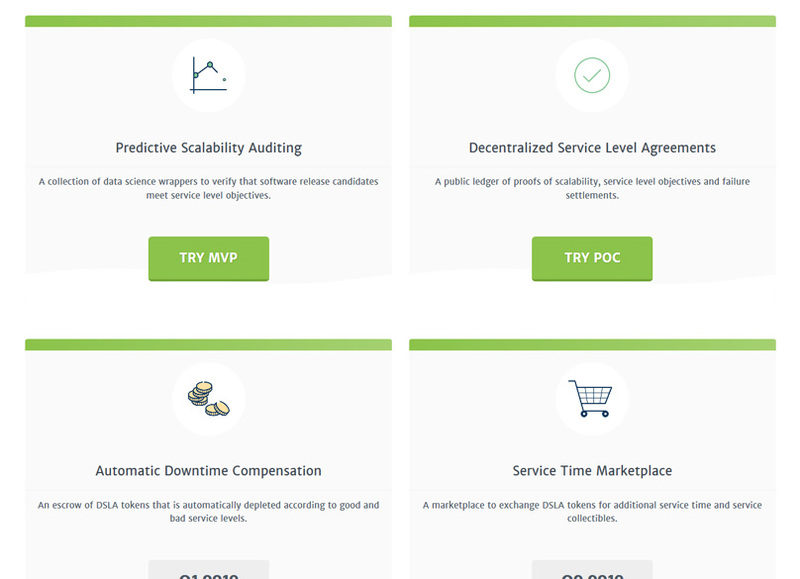 The provider defines the service level objectives as stakes their DSLA tokens to create a compensation pool. Based on the service levels, the compensation pool gets depleted. When token owners receive DSLA tokens, they can choose what to do with them. They can withdraw them to any ERC-20 compatible wallet. Alternatively, they can visit the Stacktical Marketplace to receive service collectibles. Any tokens that are exchanged on the marketplace from Stacktical will go back to the compensation pool, waiting for the next required compensation due to performance failure. The token sale from Stacktical is an opportunity for those who plan to use the platform to purchase their DSLA utility tokens. Buying them in advance will lead to a discount. It also helps support Stacktical’s development efforts. Anyone who wants to use Stacktical should consider participating in the ICO to get a discount on tokens. After all, you will need to hold a specific number of tokens not only to access the platform but also to unlock some of its features. During the token sale, there are a total of 5 billion DSLA tokens available. Each one costs 0.000004 ETH. This means that each ETH contribution is equal to 250k DSLA. There is a soft cap at €1 million and a hard cap at €3 million. The private sale ended on Oct. 31, 2018, with a discount of 40 percent. Then, there was a presale from Nov. 1–Dec. 31, 2018, with a 20 percent discount. Stacktical is currently undergoing a public sale, which began on Jan. 15, 2019 and runs until March 15, 2019. The minimum purchase is 3 ETH, and the maximum is 30 ETH. You can view a countdown to the end of the token sale on the Stacktical website. Based on the countdown, the ICO appears to have been extended until the end of March 2019. Users of Stacktical can experience customer service without any hassle. The information regarding online services will be transparent and reliable. Furthermore, users know that if they experience delays, slowdowns, or unavailability of the services for any reason, they will receive compensation. This compensation will be fair and not require jumping through hoops, filling out complicated forms, or talking to multiple representatives. Stacktical can also provide benefits to employees by allowing companies to provide dynamic rewards. These rewards would be in the form of DSLA tokens and could be for a range of reasons, such as great customer service or engineering. The rewards could also be for meeting any of the company’s Service Level Objectives. Service providers get to enjoy a turnkey platform for service level agreements and service credits. With Stacktical, providers can use a service credit system that is full-fledged with minimal effort on their part. With the help of Stacktical, providers can automatically settle disputes, saving the time of workers. There will also be a boost in the morale of employees as they no longer have to deal with credits for downtime or similar issues. Morale will also improve thanks to the previously mentioned employee benefits and rewards. With a decentralized SLA, it becomes easier to manage expectations of service stakeholders, both internal and external. This system also allows for SLAs with smaller clients and stakeholders, giving providers a leg up over the competition. 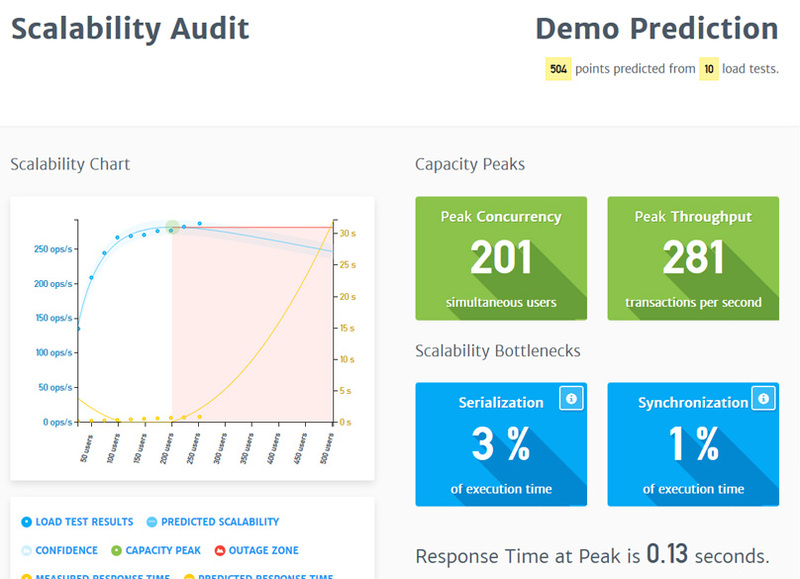 One of the many key features of Stacktical is predictive scalability auditing. This is a set of data science wrappers for checking software release candidates if they meet the service level objectives that your company outlined. Decentralized service level agreements are perhaps the most notable feature of Stacktical. These provide a public ledger with proofs of scalability, failure settlements, and service level objectives. Stacktical will soon feature automatic downtime compensation. The escrow of DSLA tokens gets depleted automatically based on service levels. This feature will be available during Q1 2019. It will also come with the Service Time Marketplace where users can spend their DSLA tokens on service collectibles or additional service time. This last feature will turn up during Q2 2019. By Q4 2019, Stacktical v2.0 will be released, with its full functionality as a decentralized service level management platform. Stacktical provides a new way of issuing and enforcing service level agreements. Thanks to Stacktical, users of various services can receive reimbursement in the form of DSLA tokens for downtime, slowdowns, delays, and other issues. This reimbursement is completed without hassle. Stacktical can also help companies reward employees for meeting objectives and more, thereby boosting morale and productivity.